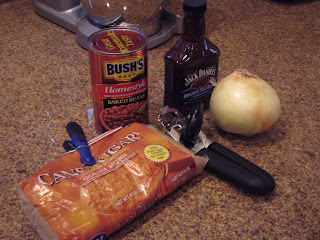 First, assemble your ingredients - 1 large can beans, brown sugar, barbecue sauce, spicy brown mustard and onion. The mustard didn't want to get into the picture. 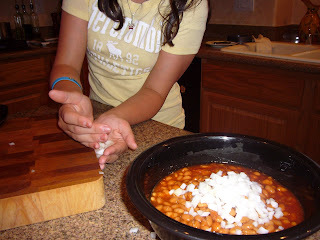 First, open the beans and pour them into a medium size bowl. Next, chop your onion. This onion was very large, so she used about 1/4 of it. 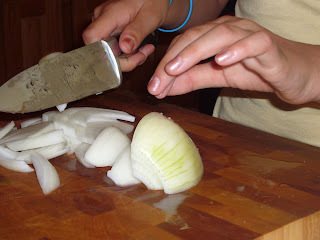 Chop the onion into small pieces. You don't want to bite into a large chunk of onion! 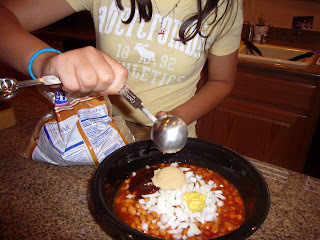 Put the onion in the bowl with the beans. 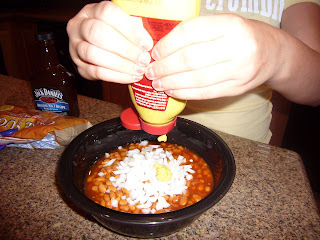 Then put one squirt of mustard into the bowl. Now 2 squirt of barbecue sauce. Then 2 tablespoons of brown sugar. 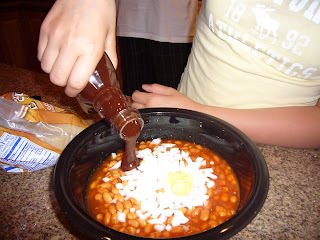 Mix all the ingredients together and pour into a greased pan. Sabrina sprayed the inside of a large loaf pan. 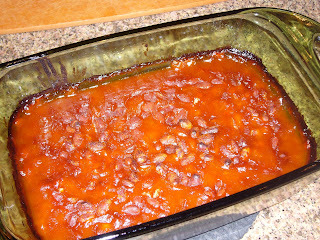 Bake in a 350 degree oven for about 30-40 minutes, or until hot and bubbly. Remove from the oven and enjoy!! Ok, so, I made these for a cookout this past weekend, and they were wonderful! 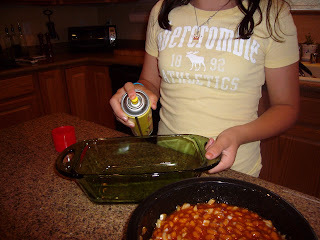 This will be my go to baked bean recipe from now on!